Shane Harper waited a long time to score his first NHL goal. He liked the feeling so much, he scored a second one. 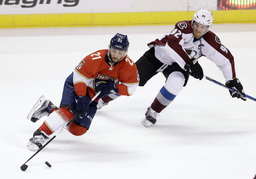 Harper scored his first two NHL goals to lift the Florida Panthers over the Colorado Avalanche 5-2 on Saturday night. "A pretty incredible feeling," said the 27-year-old rookie. "I'm just real excited to get that win, especially with some guys being out of the lineup right now with injuries. It just makes it even more important for everybody else to pick up some slack. That's what we're trying to do. That victory makes it so much better." Harper played in the minor leagues for the past seven years and notched 340 games in the AHL and sometimes wondered if he would ever get that first NHL goal. "There's times when you think like that for sure," Harper said. "I've been pretty confident in myself that it would come. I always thought I just needed to get my shot." Vincent Trocheck and Jonathan Marchessault each had a goal and an assist and Aaron Ekblad also scored a goal for the Panthers while Roberto Luongo made 26 saves. Matt Duchene and Blake Comeau scored goals for the Avalanche. Semyon Varlamov made 33 stops. The Panthers blew the game open in the third period as they scored three of four goals in a span of 2:26. Ahead 2-1, Marchessault skated in on a breakaway and fired the puck between the pads of Varlamov at 4:30 to make the score 3-1. Harper followed with his second goal of the game on a one-timer from in front to stretch the lead to 4-1. Duchene poked in a rebound past Luongo 16 seconds later to close the gap to 4-2. Trocheck slid a loose puck into the net at 6:56 to make the score 5-2 and shared in Harper's excitement. "To see him, 27-years-old, finally get his first NHL goal and pop two in the same game, it's definitely exciting to see that," Trocheck said. The Panthers took 17 shots and scored two goals in the second period. Florida had a 2-1 lead on the goal by Harper with 2:58 left in the second. Greg McKegg stole the puck from Duchene in the neutral zone and brought it down the left side. McKegg passed to Harper in front and he poked the puck over the glove of Varmalov for his first goal. "He found the back of the net twice and that was real good," Panthers coach Gerard Gallant said. "The kid played hard, he works hard and going hard to the net and you get rewarded." Colorado played a strong first period but faded in the second and third. "Crucial mistakes at crucial times cost us. (It) was not good enough," Avalanche captain Gabriel Landeskogsaid. Trailing 1-0, the Panthers evened the score at 1-all on the power-play when Ekblad took a feed from Jagr low in the left circle and one-timed the puck past Varlamov at 1:30. Ekblad recorded his first point of the season. Comeau's power-play goal gave the Avalanche a 1-0 lead at 7:38 of the first. Tyson Barrie shot from the blue line and Comeau tipped the puck past Luongo on the glove side. The goal was the first the Panthers have allowed on the power-play in nine opportunities. "A little bit of a roller coaster for us, I think," Avalanche coach Jared Bednar said. "I like the way the game started, the first period, but we weren't able to sustain it." A coach's challenge by Colorado overturned a goal by Jason Demers midway through the first. His slapper got past Varlamov but the officials ruled Vincent Trocheck was offsides before the shot. Colorado is coming off a four-game road trip and won't play until they host Winnipeg on Friday. "We need a little rest to get ready for next weekend," Bednar said. Notes: Avalanche C John Mitchell missed the game with a lower-body injury. ... Panthers LW Jussi Jokinenmissed the game with a knee injury. ... The Panthers entered the game as the only team in the NHL yet to allow a power-play goal but the streak ended in the first period. Avalanche: Host Winnipeg Jets on Friday. Panthers: Visit Pittsburgh Penguins on Tuesday.